Your tour starts at the bike shop in Bangkok, where you'll meet your private guide and receive your bike. After a safety briefing, set off toward Wat Suan Phlu School, an off-the-beaten-path temple with Thai-Chinese architecture. Continue biking to the Old Customs House next to the river, and then head to the Grand Postal Building at your own pace to see its traditional interior before passing by Siam Commercial Bank on your way to Saan Jao Joe Sue Gong, a Hainan-Chinese temple. Admire the twin dragons rooftop design, and enjoy a look at the Chinatown neighborhood, popular for local food and shopping. Next up, take a break for ice cream before continuing your tour to Wat Chakrawat, aka the Crocodile Temple, where your guide tells you stories as you look around. Then bike onto Memorial Bridge, where you can admire the Bangkok skyline. Your tour wraps up in the Thonburi area at Wat Prayoon, a temple known for its white design and courtyard. 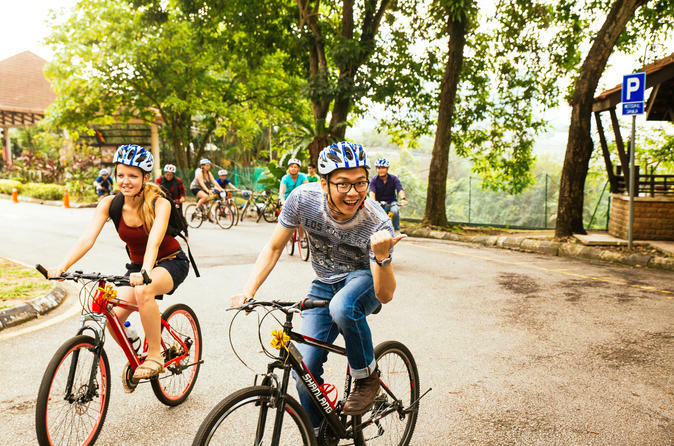 Hear more stories from your guide before biking back to the bike shop, where your tour ends.